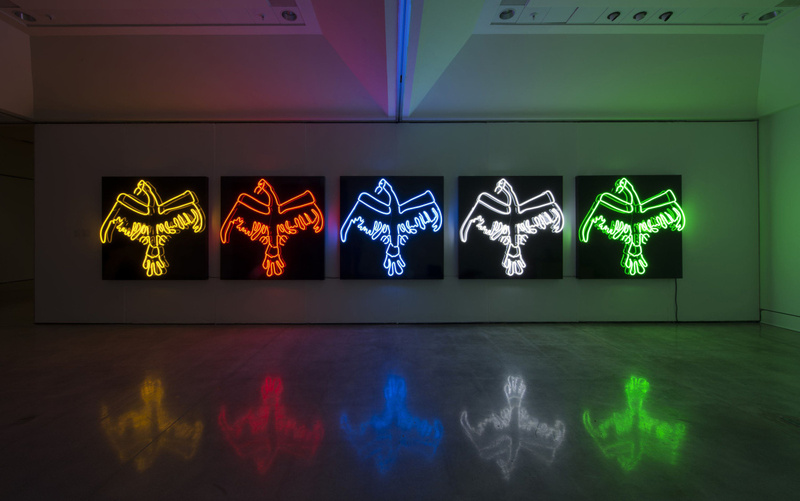 From the collection of the Art Gallery of Nova Scotia: “Tautology” is a series of neon sculptures depicting the thunderbird, a legendary creature in various North American Indigenous cultures. Linklater appropriated this specific thunderbird image from Norval Morrisseau’s seminal painting, Androgyny (1983). By reanimating the bird in neon – a contemporary, commercial material – Linklater inserts the traditional icon into contemporary discourse. Working in performance, installation, film and other media, Duane Linklater addresses issues of cultural loss and recovery as well as authenticity, appropriation, and authorship. He often collaborates with others, reconsidering oral traditions where the transmission of knowledge, stories or histories is essential to future generations. Images: Art Gallery of Nova Scotia, Sobey Art Award.